"This house was a true collaboration. As a builder, it is always a privilege to be included in the design process - from project inception, to specifications and selections, to design details, through to the final installations. The kitchen cabinetry by KR+H is made of quartered cypress with walnut trim. Counters are honed serpentine. A wider view of the working kitchen. The kitchen's banquette and desk area. KR+H's Paul Reidt noted that the homeowners appreciate craft and a rich mix of materials. Paul along with Karla Monkevich of KR+H contributed to the design of the kitchen, the living room cabinetry, and the master bath vanity - all of which were then made and installed by the craftsmen in our shop. 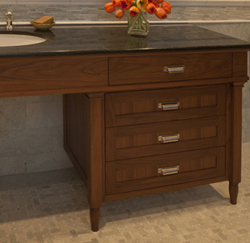 Detail of master bath vanity made from walnut by KR+H. We appreciate John Willett's offering us usage of the Lake Avenue photographs by the architectural photographer Peter Vanderwarker. It's fun to be able to share a few views of everyone's work. Michael Collins, D. Michael Collins Architect, design of the home's exterior (shown at top) has lovely details and overall design charm. The Lake Avenue home (built in 2010) is scaled nicely to the lot, takes advantage of the lake's views, and is a fine addition to this neighborhood's historic homes. In the living room (shown below), we see Michael's design of its coffered ceiling and of one of the open walls that lets light flow into the interiors downstairs. 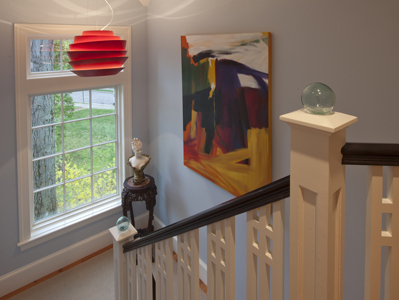 The design of the living room's fireplace and the stair railing millwork (also shown below) was by the builder, John Willett, Altair Associates, and was initiated by owners John and Amy (who brought several images of fireplace mantels they liked). Michael Collins input aided finish details, and Jose Mercado, Mercado's Interiors, provided the finish carpentry for the fireplace and stair railing. As John Willett mentioned, while he and KR+H contributed certain design elements, each in our own way, it was all led by the homeowners' desires and Michael Collins' master design. 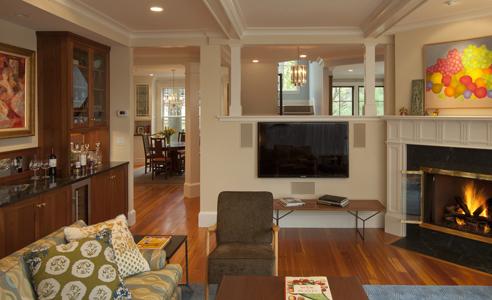 Living Room showing open wall, ceiling, and fireplace details by Michael Collins and John Willett. (KR+H made cabinetry at left). It was our pleasure to work with colleagues whose talents we so appreciate: John Willett, Altair Associates, and Michael Collins, D. Michael Collins Architects. Many thanks to the homeowners!